The Aeritalia F-104S Starfighter was a licensed production Italian version of the Lockheed F-104 Starfighter which served in the Italian Air Force (AMI, Aeronautica Militare Italiana), and was the AMI's mainstay from the late 1960s until the beginning of the 21st Century. The F-104S also served in the Turkish Air Force until the mid-1990s. The F-104S was the final development of the Starfighter line. Derived from Lockheed's design studies on a "Super Starfighter", the F-104S was one of the most capable of the F-104 series, and destined to be the last in service worldwide. The F-104S was retired from service in 2004. F-104S in original camouflage scheme with Sparrow missiles mounted under the wings, c.
The F-104 series had entered a second development phase with the F-104G. While the USAF had no more interest in the F-104, Lockheed proposed the Model CL-901 featuring the new J79-GE-19 engine and the Sparrow III missiles; "G" denoted "Germany," the lead country for this version, while "S" indicated the improved "Sparrow" version. Further proposed developments included the CL-958 with larger wings, the CL-981 with retractable canard wings behind the cockpit, and the CL-984 optimised for low-level strike missions. An RF-104G was modified and flew in December 1966 as the prototype CL-901 "Super Starfighter." Externally, the new type had slightly larger air intakes and steel inlet guide vanes that allowed an increase in operating temperature from 121°C to 175°C, enabling a maximum speed of Mach 2.2. During the first five years in Italian service, 24 F-104G aircraft were lost; and as only 80 to 90 F-104s (of 149 acquired) were operational at best, it was decided to purchase a new interceptor and fighter-bomber to reinforce the first line units. The AMI mid-1960s "AW-X" (All-Weather-X aircraft) requirement for a new all-weather fighter aircraft led to an evaluation of many available types: the McDonnell Douglas F-4B/C Phantom, Mirage IIIC-1, BAC Lightning and North American F-100S Super Sabre among others. The eventual choice was the Lockheed CL-980 (a simplified version with the same wings of the projected Model CL-901). On 26 January 1966, the AMI chose the definitive F-104S as their future fighter. The first F-104S was actually a modified Fiat -built F-104G, MM6658, that acted as an aerodynamic prototype and first flew on 22 December 1966, while a second prototype, MM6660, fitted with new avionics systems closer to the final configuration, flew on 28 February 1967. MM.6701, the first production F-104S built by Aeritalia flew on 30 December 1968. The F-104S was designed to carry AIM-7 Sparrow missiles (while deleting the Vulcan gun). In the attack role, the F-104S had nine hardpoints, and could carry up to seven 227 kg (500 lb) or 340 kg (750 lb) bombs; an improvement over the F-104G which could hold only half that payload on five hardpoints, two of which were needed for auxiliary tanks. Theoretically an F-104S could be equipped with four or five bombs, two tanks and two AIM-9s, becoming a dual-role aircraft. The new type entered service in 1969; and in that year, the F-104S accumulated 460 flying hours. The AMI bought 205 examples, all delivered from 1969 to 1979, with the 100th aircraft delivered in January 1973, and the 200th in May 1976. The model was built in two versions; as an interceptor armed with AIM-7 Sparrow missiles (the M61 Vulcan being removed); and as a fighter bomber, with the gun retained and bombs and other air-to-surface ordnance. The models were interchangeable, making it unclear how many were built or rebuilt to these specifications. AMI squadrons equipped with the F-104G and S versions were: 9, 10, 12, 18 (dual), 20 (training), 21, 22, 23, 28, 102 (reconnaissance), 154, 155, and 156 (bombers). AMI F-104S in low visibility colours. The J79-GE-19 allowed a faster climb, comparable with contemporary fighters (up to /sec, with a time-to-climb of 80 seconds claimed; ten seconds less than the F-104G), with the capability of reaching Mach 2 at in around five minutes. Napoleone Bragagnolo, a test pilot for Aeritalia, was able to land at Ciampino, Rome , 19 minutes and 30 seconds after taking off from Turin . During this flight with two wingtip auxiliary tanks, he climbed and accelerated to Mach 2. The aircraft still had of fuel onboard when it landed; enough to reach Palermo at subsonic speeds. The average speed for the flight was Mach 1.5.Even with these new Starfighters, the loss rate remained high, with peaks in 1973 and 1975 (ten F-104s of all versions were lost in AMI service during this period). Up to 1997, Italy had lost 137 (38%) of its F-104s in 928,000 flying hours (14.7 aircraft every 100,000 hours). Despite a drop in the loss rate in the 1980s (with 33 losses between 1981 and 1990 included), the debate about the reliability of this aircraft was often fierce in the mass media. In the 1980s the loss rate dropped, even more so in the 1990s, when all the old versions (except TF-104s) were scrapped.The last Italian F-104 was decommissioned in 2004, after the type had flown around a million flying hours in a total of over 40 years of service. Turkey was the only other customer for the Aeritalia F-104S. The initial order was placed in 1974, with the first of 18 examples entering service by December 1974. These first aircraft were a gift from Libya ; the reward for Turkish technical assistance to improve the capabilities of the Libyan Air Force. Another 18 were ordered in May 1975, which eventually increased to 40 aircraft. They served with 142 and 182 Filo from the 1970s, and around a dozen were still in service until the mid-1990s. While 200 Selenia AIM-7 missiles were delivered, Turkish F-104Ss were seldom seen carrying them. Two further update programs were carried out prior to the introduction into AMI service of the Eurofighter Typhoon, resulting in the F-104S-ASA and F-104S-ASA/M. 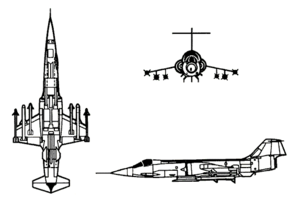 The F-104ASA (Aggiornamento Sistemi d'Arma), developed in 1986, introduced a Fiar Setter radar, with 'look-down' capability and compatibility with the Selenia Aspide missile. AIM-9Ls were then used as the main armament, replacing the previous "B" and "F" version of this missile, while the older AIM-7s were retained. One AIM-7 was usually carried under each wing. In total, 147 of the F-104S airframes were converted to ASA standard at an expense of around 600 billion lire, the last ASA model was delivered in the early 1990s. The ASA/M upgrade (initially known as the 'ECO' (Estensione Capacità Operative) upgrade) focused on improving reliability rather than combat enhancements, and involved 49 ASA aircraft. 15 TF-104Gs were also involved in this program . F-104S (Lockheed Model CL-901): 246 aircraft produced mainly by Fiat and Aeritalia (one aircraft was lost before delivery), upgraded for the interception role having NASARR R-21G/H radar with moving target indicator and continuous wave illuminator for SARH missiles (initially AIM-7 Sparrow), two additional wing and two underbelly hardpoints (to give a total of nine), uprated J79-GE-19 engine with 52.8 kN (11,870 lbf) thrust (79.6 kN/17,900 lbf with afterburner), and two additional ventral fins for increased stability at high Mach numbers. The 20 mm (.79 in) M61 cannon was sacrificed to make room for the missile avionics, the cannon was always fitted to fighter-bomber variants. Up to two Sparrow; and two, theoretically four or six, Sidewinder missiles were carried on all the hardpoints except the central (underbelly), or seven 340 kg (750 lb) bombs (normally, two-four 227-340 kg/500-750 lb). Range was up to 1,250 km (777 mi) with four tanks, ferry range 2,940 km (1,827 mi). F-104S-ASA: (Aggiornamento Sistemi d'Arma - "Weapon Systems Update") - An upgraded Italian version, with 147 modified from existing airframes, upgraded with Fiat R21G/M1 radar with frequency hopping, look-down/shoot-down capability, new IFF and weapons delivery computer, and provision for AIM-9L all-aspect Sidewinder and Selenia Aspide missiles. Due to the delays of Aspide integration, it was also called the ASA-1 with Sparrows, and ASA-2 when the Aspide became available, and eventually all F-104Ss were upgraded to ASA-2 standard. The fighter-bombers had no substantial improvements in the "ASA" version, and were later modified to interceptor standards (CI) without the M61. F-104S-ASA/M: (Aggiornamento Sistemi d'Arma/Modificato - "Weapon Systems Update/Modified") - 49 F-104S-ASA and 15 two-seat TF-104G aircraft were upgraded from 1998 to ASA/M standard with GPS, new TACAN and Litton LN-30A2 INS, refurbished airframe, and improved cockpit displays. All strike-related equipment was removed. The last Starfighters in combat service, they were withdrawn in December 2004 and temporarily replaced by the F-16 Fighting Falcon, while awaiting Eurofighter Typhoon deliveries. F-104 ASA-M, Il Portale dell'Aeronautica Militare Italiana (in Italian) Access date: 6 October 2007. Fricker and Jackson 1996, p. 98. "Aeritalia: Cornerstone of Italian Aerospace." Air International Volume 16, No. 2, February 1979. Fricker, John and Jackson, Paul. "Lockheed F-104 Starfighter". Wings of Fame. Volume 2 1996. London: Aerospace Publishing, p. 38 - 99. ISBN 1-874023-69-7. Gianvanni, Pietro. "F-104 Starfighter." Ed.Ai editions, June 1998. Michell, Simon, ed. "Alenia (Lockheed) F-104S ASA Starfighter Upgrade." Jane's Civil and Military Aircraft Upgrades 1994-95. Coulsdon, Surrey, UK: Jane's Information Group, 1994. ISBN 0-7106-1208-7. Niccoli, Ricardo. "'S' is for 'Sparrow'." Air Enthusiast Issue 117, May-June 2005. Niccoli, Ricardo. "Starfighters in the AMI". Air International Volume 31, No. 6, December 1986. Pace, Steve. F-104 Starfighter: design, Development and Worldwide Operations of the First Operational Mach 2 Fighter. Oscela, Wisconsin: Motorbooks International, 1992. ISBN 0-87938-608-8. Taylor, John W.R., ed. "Aeritalia (Lockheed) F-104S" Jane's All the World's Aircraft, 1976-1977. London: Macdonald and Jane's. 1976. ISBN 0-53103-278-7.